Author Jose Pizarro of Basque concedes that Apple Tatin is a French recipe, not a Basque one. Although, in his defense, the Basque region covers both northeastern Spain and southwestern France. He says he has included it because he likes it. And the Basque region is rich in apples that deserve a tatin destiny. Now, his honesty is admirable. This picture is seductive. 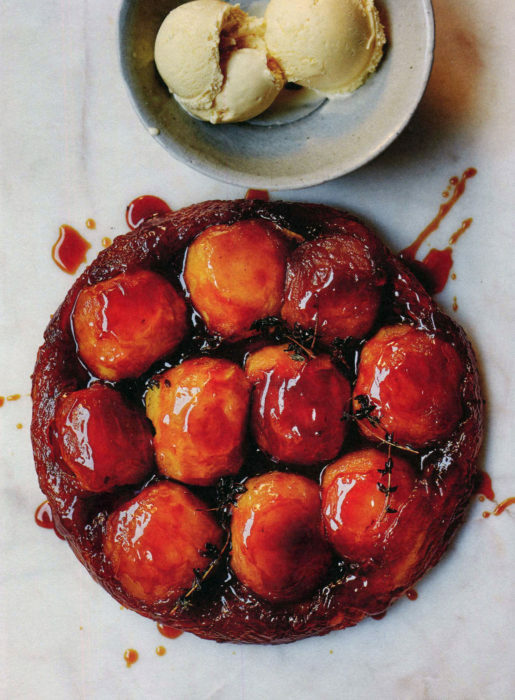 And the thought of combining apple tatin with honey ice cream is just too great a temptation. Sweet tooth? Tired of chocolate? I bet Eve of Adam and Eve would have loved this dish. One of the great things about apples is that they are available year round. Try this recipe year round. Fresh summer apples will offer one flavor, later winter apples that have aged and intensified may well seem even better. To make the ice cream, heat the milk with the sugar until almost boiling. Beat the honey, egg yolks and salt together in a bowl until light and fluffy. Pour the hot milk over the egg mixture, stirring until smooth. Pour the mixture back into a clean pan and put over a medium-low heat and cook, stirring constantly, until you have a thick, smooth custard. Pour into a bowl and, when cold, stir in the cream. Pour into an ice-cream maker and churn until set, then scoop into a container and freeze until ready to serve. For the tatin, pour the sugar into a heavy-based oven proof frying pan with a 20 cm (8 in) diameter base and add a couple of tablespoons of water. Stir to mix, then place over low heat and cook very gently, stirring, until the sugar has dissolved. Stop stirring, increase the heat to high and bubble until you have a dark golden caramel. Add the butter, stirring quickly until smooth, then put the apples, cut side up, into the pan, with the thyme. Return to low heat and cook for10 minutes, then set aside to cool completely. Roll the pastry out on a lightly floured surface and cut a round a bit bigger than the pan. Tuck the pastry over the top of the apples so it sits snuggly round the side of the pan. Bake for 25-30 minutes until the pastry is golden. Leave to stand for10 minutes before turning out onto a plate and serving with the salted honey ice cream.